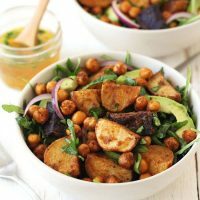 A classier version of our favorite meal-sized salad, this Roasted Baby Potatoes and Chickpea Salad is a nutritious dinner that’s big on flavor but light on effort. You’re going to love the bright and refreshing 1-Minute citrus dressing! 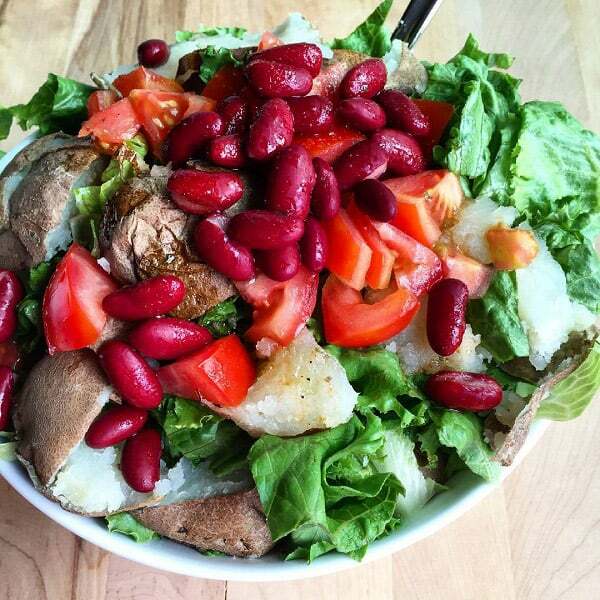 Baked potato salad is our favorite go-to dinner when you have zero ideas, energy, or desire to cook but still want to eat healthfully. It’s a clean-out-your-fridge-toss-it-ALL-in there kind of recipe that takes little to no thought to throw together and fills your stomach with lots of good-for-you vegetables. Okay, so that salad kind of looks like a fresh hot mess right? 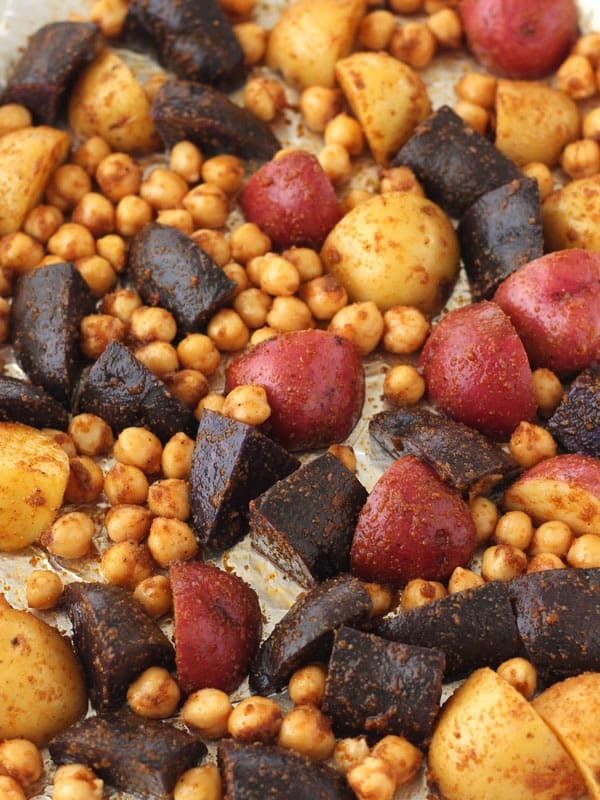 For a classed-up version that’s still easy but looks fancy enough to serve your mother-in-law, swap the baked potatoes and kidney beans for smoky spiced chickpeas and roasted baby potatoes. It’s Delish! A filling meal-sized salad that's big on flavor but light on effort. Slice potatoes into quarters and place in a large bowl with chickpeas, oil, salt, pepper, cumin, garlic powder and paprika. Mix well to coat. 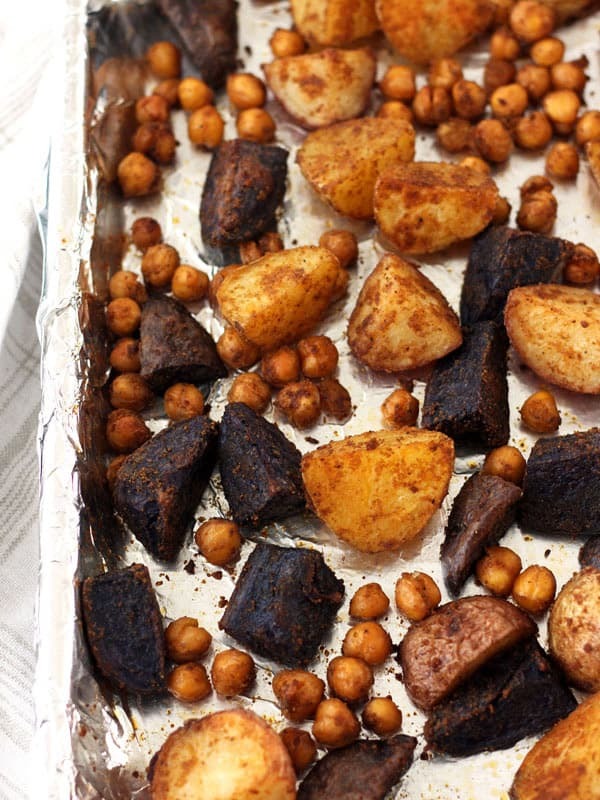 Spread potatoes and chickpeas into a single layer onto your prepared pan. Cook for 25 to 30 minutes, stirring pan after 15 minutes, until the chickpeas are lightly crisped and potatoes are fork tender. 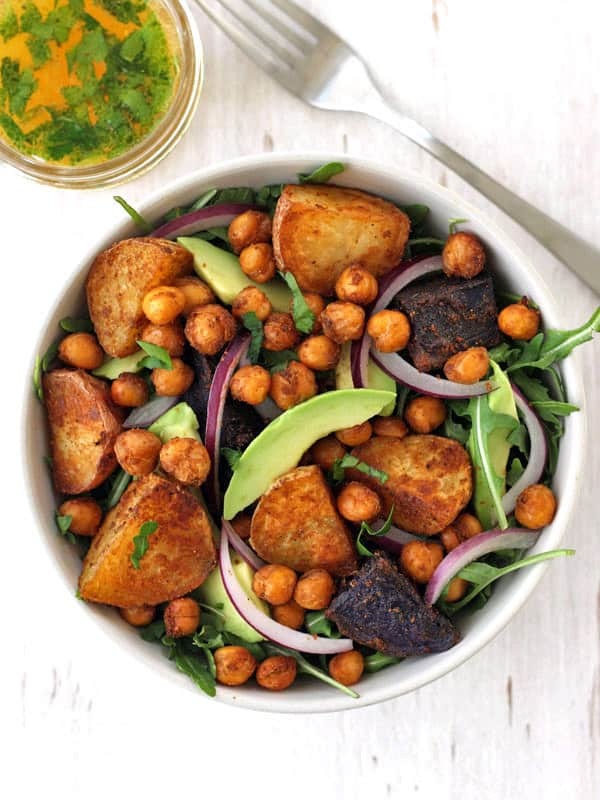 While potatoes cook divide the arugula, avocado, and red onion into two large salad bowls. Once potatoes and chickpeas are ready, allow them to cool for 5 minutes before adding to salads and drizzling with dressing. Convection Toaster Ovens: Reduce temperature to 375 and cook 23 to 25 minutes. For Super Crispy Chickpeas: dry rinsed chickpeas well removing the little skins and separate chickpeas from potatoes on the sheet pan. Nutritional Information is an estimate for 1 of 2 servings undressed. This salad will taste great with any dressing. The quick Citrus Dressing below is bright, tangy and perfect paired with the smoky spiced potatoes and chickpeas. A bright and flavorful 1-minute citrus dressing. Place all ingredients in a small jar covered with a tight-fitting lid. Shake until well combined. If you haven’t tried roasting chickpeas or garbanzo beans in your toaster oven yet, you’re missing out. They’re a great high-protein snack and so easy to make. And it just so happens that 400 degrees F (the best temperature for roasting chickpeas) is perfect for making a batch of creamy roasted baby potatoes too! The chickpeas in this recipe don’t get ridiculously crunchy like the ones in those expensive snack bags at the grocery store. Instead, they’ll be crispy on the outside with a slightly chewy inside. 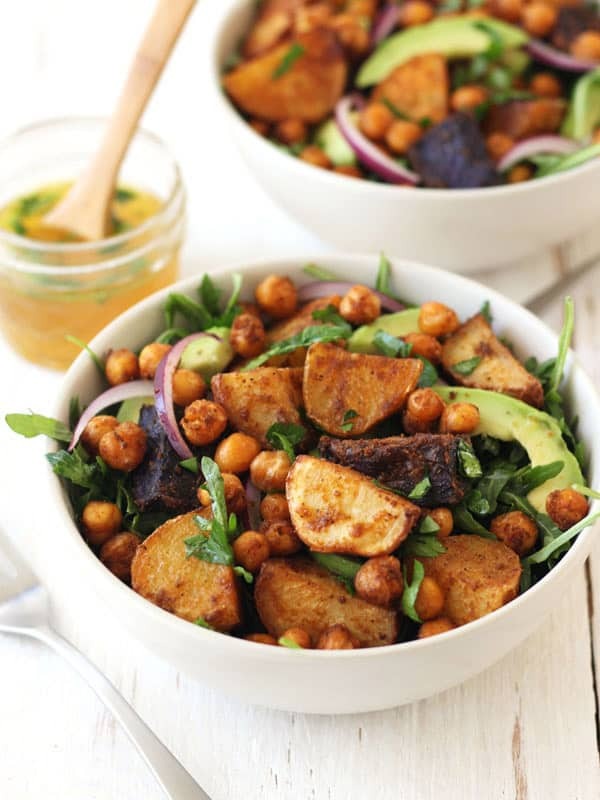 We like to serve the potatoes and chickpeas in a pile of herby arugula with avocado, red onion and the brightest citrus dressing around. But they’ll taste great with any fresh veggies and dressing you have on hand. 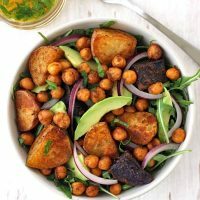 If you can keep a can of garbanzo beans in the pantry and some leafy greens in the fridge you’ll always be just one bag of baby potatoes away from a satisfying spring dinner of roasted baby potatoes and chickpea salad. LOVE roasted chickpeas but i usually only have them as a snack! what a great idea to incorporate them into a hearty salad!